Wednesday afternoon I will also be presenting a breakout session on OData:. Below is the official write-up, however, I will be showing first how to build an OData service (first via Astoria or *.Data Services, and then with other methods such as SQL Azure, etc) and then how to consume the service via several different technologies including ASP.NET, Silverlight, PowerPivot, and more. I’ll show some non-Microsoft technology along the way. I’m thinking no slides, just code for this talk. Applications today are expected to expose their data and consume data-centric services via REST. In this session we discuss what REST is and have an overview of Windows Communication Foundation (WCF) Data Services and see how we can REST enable your data using the Open Data Protocol (OData). Then we cover how to leverage existing skills related to Microsoft Visual Studio, LINQ and data access to customize the behavior, control-flow, security model and experience of your data service. We then see how to enable data-binding to traditional ASP.NET controls as well as Microsoft Silverlight and Microsoft PowerPivot for Microsoft Excel 2010. We then turn to consuming SharePoint and other OData-based applications in Microsoft .NET as well as from a non-Microsoft client. This is a very demo intensive session. I have some other MVP booth duties and some ask the experts hours, but when I am free, I will be at the Telerik booth. We’ll have a large staff at TechEd this year! I will be doing a blog post on each of these in the coming weeks (expect some delays with TechEd US in the way.) One more thing to mention is that the Data Services Wizard now generates a Silverlight client and will give you the ability to automatically style the application, a feature I previewed last week at the Sydney User Group. Come to GeekFest in New Orleans! Let’s face it, going to a technical conference is good for your career but it’s not a whole lot of fun. You need an outlet. You need to have fun. We are bringing back GeekFest! Join us at Pat O’Brien’s for a night of gumbo, beer and hurricanes. There are limited invitations available, so what are you waiting for? If you are attending the TechEd 2010 conference and you are a developer, you are invited. To register pick up your "duck" ticket (and wristband) in the TechEd Technical Learning Center (TLC) at the Developer Tools & Languages (DEV) information desk. You must have wristband to get in. 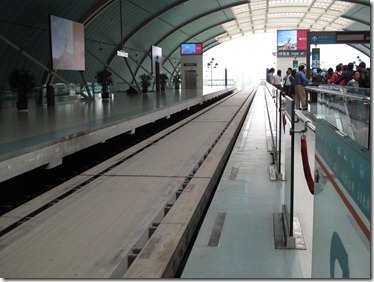 This weekend I was traveling to the World Expo in Shanghai and there is a maglev train connecting the airport to the metro system. 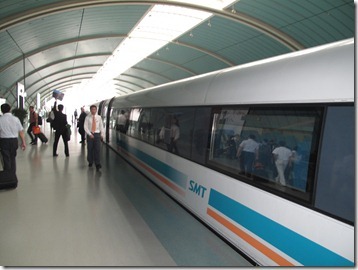 The Shanghai Maglev Train was the world’s first commercial maglev train and also is the fastest. Maglev, or magnetic levitation, is a system of transportation that suspends, guides and propels vehicles, predominantly trains, using magnetic levitation from a very large number of magnets for lift and propulsion. 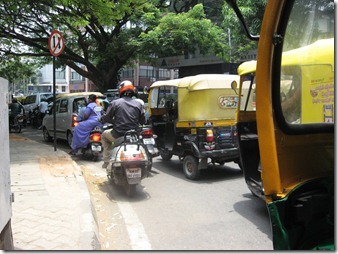 This method has the potential to be faster, quieter and smoother than wheeled mass transit systems. The power needed for levitation is usually not a particularly large percentage of the overall consumption; most of the power used is needed to overcome air drag, as with any other high speed train. 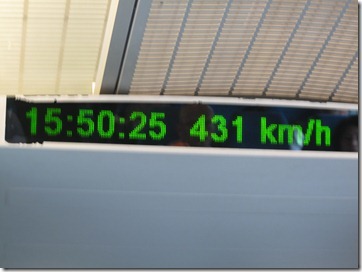 We got on the train at the airport and rode and accelerated to 431 kph and then lasted at that speed for about a minute. In total we covered 30km in 8 minutes. This is the fastest train in the world. It was pretty cool, no real track! It was super quiet, the only thing we heard (besides all of the tourists like me taking photos) was the air outside zipping by. No sound of engines or wheels on a track. I gave her this to read in Wired about high speed rail in the US. They are coming soon. I had a quick visit to Sydney this week, my first time back to Sydney in something like 18 years. 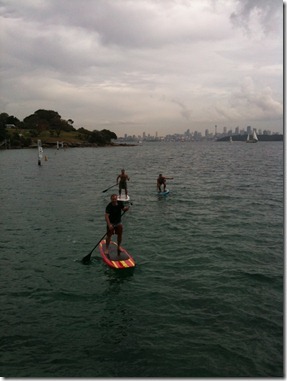 Flying in from Hong Kong was only about 8 hours, and when Adam Cogan picked me up from the airport, he took me directly to Watson’s Bay where we went Stand-up Paddle Boarding. The weather was cold and a storm was brewing, making conditions, well a little crazy. TJ, Adam, and I risked hypothermia and had a blast! After the break I talked about WCF RIA Services that shipped the other day. Just like before, I ripped off Brad Abrams blog here and showed items 1-5, plus #8 with a PowerPivot client. The PowerPivot client seemed very popular! It was a great trip and I hope to be back soon. When the Nexus One shipped, Google was changing the rules in the mobile phone market in the United States. Google made the Nexus One available only via its Web Site, with or without a plan. I bought my Nexus One on the web and use it with my existing AT&T plan when I am in the US and my existing Vodafone plan when I am home in Hong Kong. Never before in the United States could you just buy your phone from a manufacturer or a retail outlet unlocked and then walk into a carrier with your unlocked phone and buy a plan. (This is how it is done here in Hong Kong and most of Europe.) By making a hot new phone that lots of people want, Google was changing the rules and starting a revolution. The revolution lasted only 5 months. The carriers fought back: Verizon and Sprint have decided not to support the Nexus One. On Friday Google announced that it is closing the Nexus One web store down. The Nexus One will be still be available but now you will have to buy it from a carrier with a plan. I don’t know if the phones will continue to be unlocked, however, even if they are unlocked, this is a step backwards. Google says that people want to play with the phone first and that is why they are closing down the web store. If that was true, Google would sell the phone in Best Buy and Walmart, the real reason is that the carriers balked. Google is now in an all out war with Apple and the iPhone, so they need the carriers on their side. Google will soon release a competitor to the iPad on Verizon’s network, so my guess closing the web store was a concession to the carriers. The carriers win this round. Now it is up to Microsoft and its Zune Phone to change the rules. I had a nice chat with Abhishek Baxi and Manan on Microsoft Talk about: TechEd 2010 India, the Visual Studio 2010 Launch, Telerik, the MVP program, and Karaoke. I also spoke about my love for the IPL, Indian food, Punjabi music, rides in a tuk-tuk, hailstorms, and Bangalore traffic as well. I’m about to leave for a 12 day road trip that will take me to six different countries on three continents. 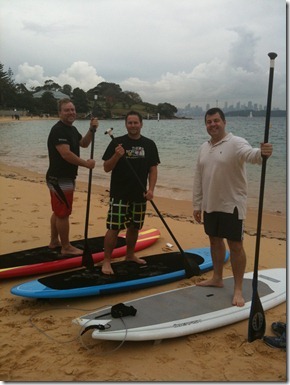 My first stop, arranged by Adam Cogan and Telerik, is an Agile Seminar in Sydney, Australia. Should be fun, at least they already know what Rugby is and will get my sports references. I will also be speaking on Silverlight at the Sydney .NET User Group. I’ll be doing my WCF walk through and then a RIA Services demo, about 2 hours, no slides, only Visual Studio. In addition to my presentation, I will also be demoing the new Telerik Data Services Wizard at the user group and show how to build a data driven Silverlight application in 30 seconds. I will also unveil to the world a brand new feature of Telerik OpenAccess/Data Services Wizard at the user group. 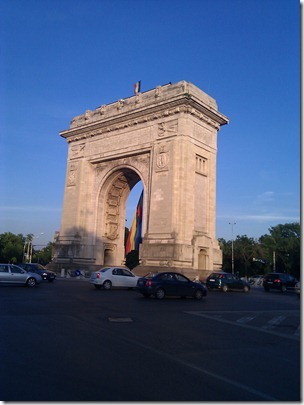 The week after, I will head to Sofia and visit the Telerik mother ship for a few days. 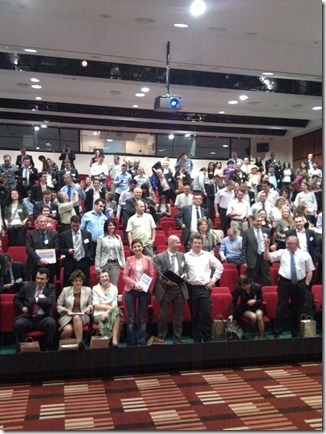 Then off to Romania to speak at a PMI conference, on yes, Scrum. A quick one day layover in Istanbul to visit the infamous anti-suckieness club President and Vice-President: Malek and Goksin. Not sure if they, now both being Microsoft employees, will make me go see customers or not. Should be fun, I hope to see you at some of the events! This feature allows a site like Yelp to know a lot about you before you ever visited it. Yelp would automatically register you (saving you the time to do it yourself!) and allow you to log in with your Facebook credentials. Yelp would then customize the site based on your information and your contacts’ preferences. I think that is cool, I would rather know what my friends think of a new restaurant than total strangers. We already allow Google to read our email, far more private than our Facebook profile data, and target us ads. 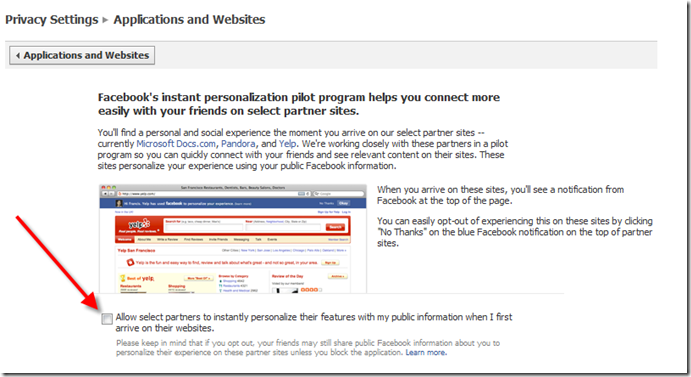 Facebook wants to take that one step further and make your social graph portable. In my opinion, the opportunity to have your social graph and preferences follow you from site to site is pretty powerful. A portable social graph is the next wave of social networking. Instead of interacting with your friends just in Facebook, you can now rely on them on the entire Internet! This has endless opportunities. One obvious example is travel. I just booked a hotel room. I read through lots of reviews on travel sites and looked at photos, etc. Wouldn’t it be cool to know if any of my friends stayed at hotels in that city automatically when I go to the site. Wouldn’t it be even cooler if Facebook figured out what I was traveling for based on my social graph and links to sites like Expedia and targeted me offers based on my preferences. I just booked my tickets to TechEd USA in New Orleans, it would be great if the Expedia via my portable social graph from Facebook told me “25 of your friends are staying in New Orleans until Saturday, want to extend your stay one night at 10% off?” I already get 100 annoying status updates a day saying “Landed in SFO!” Imagine if those annoying messages could be put to good use by adding some intelligence and aggregation. This can be extended to all sites on the internet, not just travel and leisure. What about just regular browsing? It would great to know what your social graph is reading. Isn’t this what twitter is trying to be? After the annoying “Watching my kid play soccer” updates, a ton of updates are links to articles. Facebook can bring more order to that with aggregation, history and “like”. Digg is trying to do this, but not with your social graph. Not only can an open social graph push this all out to you, it would work on demand too. Think about just reading an article on a blog, or another site like BBC.com. It would be great if I was alerted that 2 of my friends commented on this story in the tons of comments below. A portable social graph will do that. It will be a brave new Internet. A portable social graph is the future. Facebook is just taking us there kicking and screaming. You must register at https://www.clicktoattend.com/invitation.aspx?code=147964 in order to be admitted to the building and attend. Come take a look at the new features available in Visual Studio 2010 that will help make you a more productive developer. In this session we’ll see new features such as the new appearance and behavior of the IDE, code navigation features including the new easier-to-read code editor, search-as-you-type and call hierarchy. We’ll also take a lap around some of the new web development and deployment features. 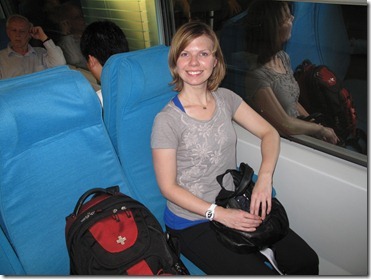 Rachel is a Developer Evangelist for Microsoft based in New York City. Previous to her work at Microsoft, she has been working as a mentor, instructor, software developer, architect and DBA for nearly 20 years. During her career, Rachel has worked with a variety of languages, technologies and systems and has contributed to projects of all sizes including large scale enterprise applications at some of the world’s leading companies. Rachel’s expertise lies within developing solutions that align business and technology using the Microsoft .NET family of products, particularly ASP.NET & SQL Server. She is a former ASP.NET MVP & former ASPInsider and continues to hold the Microsoft Certified Trainer, MCAD & MCSD certifications. Busy on the weekends in June? No, I’m not asking you out on a date. I’m excited to announce that registration is now open for three free Saturday events in New York City this June! Douglas Purdy (@douglasp) and Jonathan Carter (@lostintangent) are doing an oData Roadshow in 7 cities around the world. Their first stop is New York City this Wednesday, May 12, 2010! Join us for the OData Roadshow and learn how to implement Web APIs using the Open Data Protocol. This event will include depth presentations and hands-on time for you to explore ideas on building an API for your web application. An important part of the OData Roadshow, will be the afternoon hacking sessions, where you'll have a chance to work OData into your own projects on whatever platform you choose. Bring your laptop, ready to experiment with your ideas and pound out some code. Want to tweet about the OData Roadshow? Use the hash tag #OData. Douglas Purdy is CTO, Data and Modeling in Microsoft’s Business Platform Division. Jonathan Carter is Technical Evangelist in Microsoft's Developer & Platform Evangelism group. Monetizing your OData services via "Dallas"
Open discussion and hands-on coding time to experiment with ideas and uses for OData in their current/future projects. SQL Server 2008 R2 was RTMed a few weeks ago and late last week it was available for download on MSDN. You can also do download the Express version and evaluation versions from the Microsoft web site. I was trying to install R2 over the weekend in a Win7 VPC and hit a snag. I downloaded the iso from MSDN and mounted the iso as my VPC’s DVD drive. Halfway through the installation it bombed. Argh. I got the very descriptive error message 2337. Great. After intense googling I reached out to an email listserver I am on. A colleague of mine, Bob Beauchemin, suggested that I burn a DVD and then run it from there. He thought that it was a problem with the VPC iso reader. I tried this and it did not work, but because my Win7 VPC did not allow me to mount my physical DVD drive. So I mapped a network drive on the VPC to the physical DVD drive (using the integration features), copied the files over to the VPC desktop and ran my install from there. Worked like a charm. 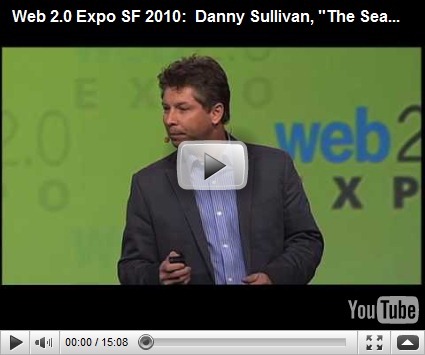 At the Oreilly Web 2.0 Expo, Danny Sullivan gave a great talk on how Google does business and what is right and wrong with it all. Worth watching. I’ll be speaking at the Office 2010, SQL Server 2008 R2, SharePoint 2010, and PowerPivot launch event next Thursday at the Conrad Hotel in Central, Hong Kong. This will be a unique event, we have a special skit planned revolving around the World Cup and located at: Starbucks, a florist, a local Hong Kong pub, and the airport. All of the cool technology will be on display! About a month or so ago I showed on this blog how to connect to MySQL using Telerik's new LINQ implementation. Today I will show you how to take it one step further and build an OData service automatically using the Telerik Data Services Wizard. 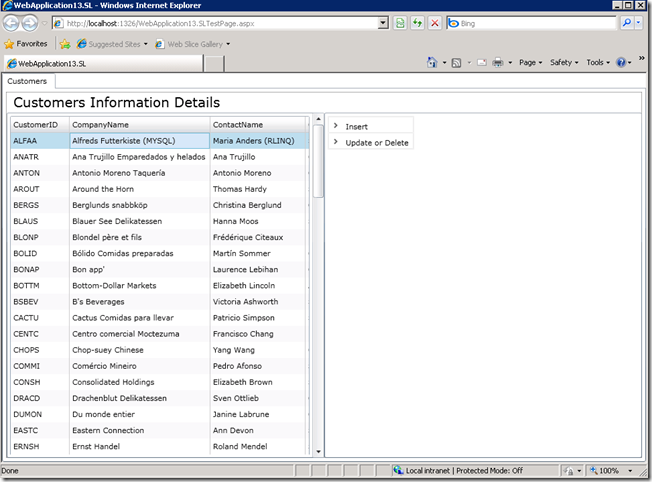 Just for fun, we will also automatically add a full CRUD Silverlight application that consumes the OData service. We’ll do this all in 30 seconds! To get started, you have to download MySQL 5.x and the MySQL Workbench and also, as my colleague Alexander Filipov at Telerik reminded me, make sure you install the MySQL .NET Connector, which is available here. 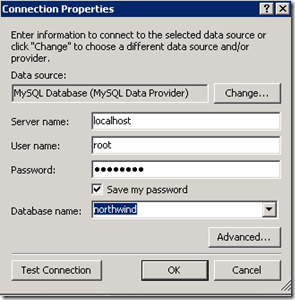 I like to use Northwind, ok it gives me the warm and fuzzies, so I ran a script to produce Northwind on my MySQL server. There are many ways you can get Northwind on your MySQL database, here is a helpful blog to get your started. Let’s get started! First we will just build our model with Telerik’s new LINQ implementation. I will repeat the steps I showed off in this blog post. 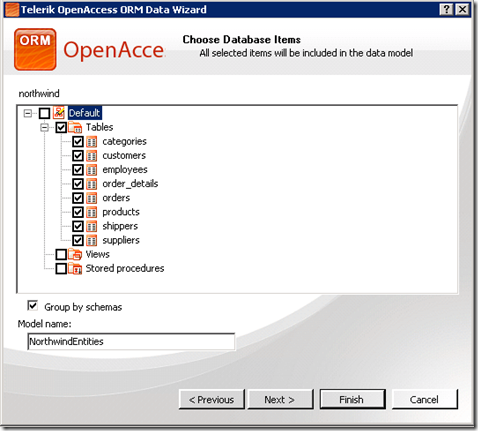 Start up the Domain Model wizard by right clicking on the project in Visual Studio (I have a Web project) and select Add|New Item and choose “Telerik OpenAccess Domain Model” from the new item list. 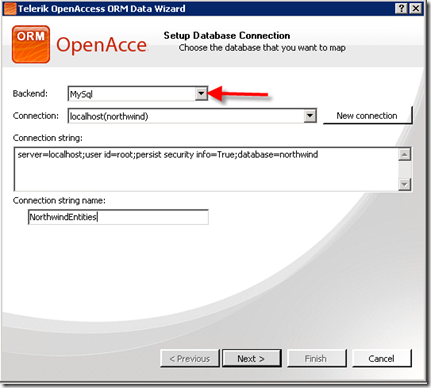 When the wizard comes up, choose MySQL as your back end and enter in the name of your saved MySQL connection. If you don’t have a saved MySQL connection set up in Visual Studio, click on “New Connection” and enter in the proper connection information. *Note, this is where you need to have the MySQL .NET connector installed. After you set your connection to the MySQL database server, you have to choose which tables to include in your model. Just for fun, I will choose all of them. Give your model a name, like “NorthwindEntities” and click finish. 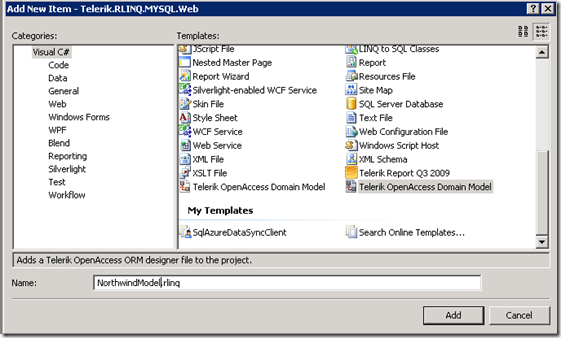 Now you have a new Telerik Domain Model named NorthwindModel.rlinq. Now we are going to use the Telerik Data Services Wizard to build our OData service endpoint via WCF Data Services (Astoria) and also automatically build a Silverlight client that will consume this service. The service has full CRUD capability and the Silverlight application is pretty basic, but wires up the application to the service and gives you the hooks to extend on. We are going to use the “express” version of the Data Service Wizard and build the service and Silverlight client in less than 30 seconds! (Note: I showed how to do this using SQL Server here.) 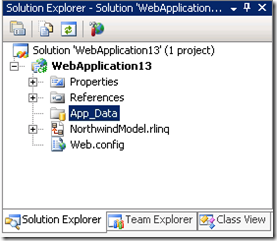 To do this, right click on the NorthwindModel.RLINQ file in the solution explorer and choose from the context menu: Data Services Wizard|Data Services for .NET 3.51 Sp1 Version 2 (Astoria)|Add to Project with new SL Client|WebApplication13. Nepal Charity Follow-up: Let there Be Water! Last year I went to Chyangba, Nepal, my Sherpa's village in a very remote section of Nepal and helped build a library for the local school. I was part of a charity effort and we raised a lot of money, a good portion from the Microsoft .NET Community. 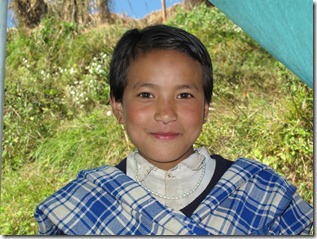 I’ll be headed back to Nepal this September and will help start a new drive to raise money for a new school building. 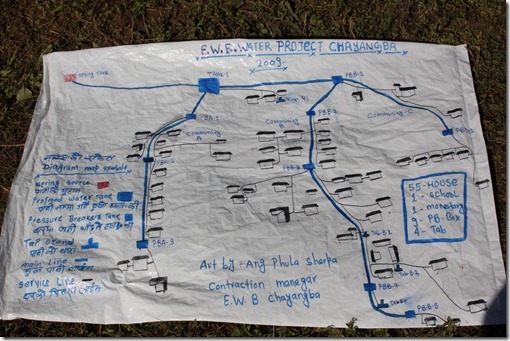 While we were in Chyangba, Engineers without Borders started a water project. An engineer from the US, Jim, arrived and started working on bringing running water to the 60 homes in Chyangba. This is a big deal since the common water tank usually has poor water. Well, 7 months later, the project is a success. Below is the full report from Jim the engineer. We've had the system running off and on for about 10 days, but now it is completely online and serving all 56 houses. It is also set up to serve two more houses that will be built in the coming months. The people seem very happy and some of the older women especially are grateful to have taps in their houses. I have a lot of kahtahs. I'm in Kathmandu. I arrived yesterday and leave in two days for the US. All in all it seems to be working remarkably well. I didn't get to measure the flow rate at every house, but the houses get 1 L between 7 and 13 seconds depending on their location relative to the tank that serves them. It's a pretty good flow rate. As Phula so eloquently puts it, "the people are really satisfaction with the water." There were a few bugs that we had to work through. 1. The pipeline from the intake to the reservoir was having low flow issues. At times we were only getting .4 LPS down to the reservoir when we would measure 1 LPS or more at the intake. Installing a control valve on the tank inlet and closing the air vent at the intake appears to have solved he problem. I think the pipe was not flowing full and that caused the water to slow down when coming through some u-profiles. Blowing into the air vent pipe at the intake would cause the pipeline to flow anywhere from 1.5 to 2 LPS for half an hour to 2 hours, but then the flow would drop to .4 LPS. With the control valve, were are getting .83 LPS into the reservoir, which is enough water. I measured the flow over 48 hours and it stayed constant. I've been talking to Phula every day since I left the village he said the water is still coming the same. 2. The pipeline from the reservoir to PB B1 does not flow well unless the tank is full. First we were able to fix the problem by adjusting control valves to PB A1 and B1 to keep the tank full, but today Phula installed float valves in the three tanks in Community A and he said that works much better. He said that keeps the tanks in Community B mostly full, which is good. 3. We had a blocked pipe on one of the house lines--it ended up being easy to find because it was before the first tee and the first tee was close to the PB. We never found out what the block exactly was--I presume it was mud because dirty water came through the pipe we dug up and disconnected. After rejoining it, the water was working fine. We have had only tarps covering the PBs as we've been playing with valves and checking flows at all the tanks. The roofs are too heavy to be moving on and off several times per day. That allowed some dirt to get into the tanks, which is what must have caused the block. 4. Phula is currently cleaning all the tanks and putting the roofs on, but it will take a few days. We had built a rim around the water tank at each PB for the roof to fit into, but we have had some tolerancing issues--some of the roofs don't fit inside the rim because the corners aren't perfectly square, despite multiple measurements a few inches of safety margin. The rims will have to be chipped slightly and then replastered. It is really only a cosmetic issue; I liked the idea of rims to help keep dirt from sneaking in under small spaces between the roof slab and the top of the water tank, but it is difficult to do things with much precision here, at least with these masons. The masons have generally refused to use levels, claiming they could eyeball it. Some of the tops of the tanks are little sloped or uneven, and the roof does not fit snugly. For now I think putting a tarp under the roof will be sufficient, but it is a repair job that we should address in the future. 5. There are seven houses that are sometime affected by a weird air block. If the tank above them is drain and then refilled, water won't flow to the houses. However, the problem is an easy fix--the houses take their pipe outside, open the tap, and once the water comes, close the tap and put it back into the house. The pipes enter the houses by climbing up the outside stone wall, through a hole in the rafters, and then back into the kitchen. The people seem to prefer this to tunnelling to the mud and stone walls or foundations. The seven houses are the five houses in Community C, one house in Community A, and one house in Community B. The house in Community A is probably not far enough below the tank that serves it. At only 7 meters of elevation difference, it's right at the limit of the design recommendations. The water level in the tank adds about 80 cm of head. However, the water flows well once the pipeline has been reset--that house gets 1 L in 13 seconds. The house in Community B is served by an HDP pipe PB and is 12 meters below it. The pipe tanks are small and they don't add much head to the outflow, but the pipe into that house also climbs steeply up into the house. The five houses in Community C are more of a mystery to me: blowing into the air vent at the PB C1 outlet or taking the pipe outside and opening the tap fixes the problem. PB C1 is small and only adds about 40 cm of head to the outflow, but the pipes in Community C climb straight up two meters into the top floor of the houses, which is more than in most places. All of the houses are between 23 and 29 meters below the tank, which seems like it should be more than enough to force the air out of the pipeline. However, all of the houses are affected simultaneously--it makes me wonder if there is some air block before the first tee. There is a small U-profile of 115 cm, which seems like it should be insignificant as it occurs 9 meters below the tank, but maybe because the water level in the tank is relatively short it makes a big difference. None of the houses get this problem when we leave the water running continuously, which we only did the last 48 hours I was in Chyangba. I will continue to check in with Phula about it, but he has not reported any more problems. In this case, I don't fear not hearing about problems due to the Sherpa cultural taboo on disappointing a guest; the villagers have not hesitated in the past to tell me--sometimes quite rudely--that their water was not coming. Right now, Phula is working on some tasks like building a fence at the reservoir and at the intake; cleaning all the tanks and putting on the roofs and making sure they fit; organizing and cleaning the tools; and backfilling the partially buried joining and tee areas (which not filled in to see if there any leaks once we got water running). He thinks he will be finished in one week. I left him with a specific list and I have a copy of it; he signed an MOU stating that he will email pictures for me to review before he will be paid by Pem. I get the sense that he is doing a good job with it. He does have some pride in the work he has done, but I think he doesn't express it when I am around because he focuses on trying to guilt trip me into getting him either more money from EWB or a visa to USA. It's annoying and disappointing, but it's part of this game. At least he does the work. Due to the troubleshooting, I did not have time to survey Sishakhola. I think an adequate survey time would be three of four days, and I didn't have the time. It was more important to me to get Chyangba's system working well enough to where I felt comfortable leaving it with the village and Phula. I know that may disappoint some of you and I know I said I would make the time for it, but respect that I have worked every day for 7 months straight in considerably frustrating conditions. We really need to see how well Chyangba's system works in the long run before we start on Sishakhola and an inadequate survey would only create the same problems for Charlie that I had. Additionally, surveying is more than measuring; when you do it, the people expect you to come back and build it the system. I don't know what is going on with money and commitments at home and I am certainly not ready to make a commitment to Sishakhola myself. Speaking of you Charlie, I really think you should come for a short visit first, see the village, and know what you are getting into before you spend 3-4 months here. You will benefit a lot from what I have learned and that will make it easier for you than it was for me, but this work is difficult. I think a trip in the fall is still very important to check on the Chyangba system and making sure it is being used properly and the people are taking care of it. Phula and I did a one day training course the day before I left; the people impressed me with how quickly they learned, how handy they are, and that they have the patience to fiddle with valves and pipe wrenches. They can be incredibly creative and come up with simple and effective solutions with limited resources--they made tweezers out of bamboos to clean the tap drains, for example. While the villagers and those on the training course seem like they know how to do everything to take care of the system, I worry that they don't understand why they must care for it. They complain a lot about their old government system--that there wasn't enough cement used or that is was a "Nepali project"--but the reality is that system worked surprisingly well, and got away with fewer and smaller PBs. Had the pipe been adequately buried, it would probably be still functioning. The real problem is that the people in Chyangba never took any responsibility or leadership for trying to fix the old system. They could have easily remade roofs for the PBs from relatively inexpensive local materials like slate and wood--concrete is not always necessary. They could also have made fences from local wood around the PBs to protect them. What they had before was good enough that they could live with it--there was no motivation among the villagers to try to improve it. That's what worries me about the future of this system--their lack of motivation, not lack of knowledge, skills, or resources. I hope that between 40 days of labor from each house and 500 rupees from every house, they will value their own efforts and money and will want to take care of it. I wish I had more time to spend on the training course, but I had to spend the time to fix the bugs in the system. Phula will create a new water council from the training course members that has several women and fewer monkey brains--it will be important to keep working with them in the future. A trip in the fall could focus on reviewing the training course and maintenance requirements and surveying Sishakhola. A bigger intake and a collection chamber would capture more water and would make the flow to reservoir greater and will probably be necessary if Chyangba's spring serves Sishakhola; that could also be done in the fall. As I keep in touch with Phula and learn more about how the system works, it may be that float valves everywhere would make it better. If that were the case, we would need to build 5 more PBs in the fall. I'm hoping that won't be necessary.